No need to get yourself all worked up. We have been up cooking all night, every night. You can tell simply by the way we smell. Love that aroma.? Nothing like that smoke streaming from the barbeque. We know, you can almost smell it. Now if dreaming about it is enough for you we can sit here and chat about it all day long. We just have to keep an eye on the meat. We can tell you about those great big potatoes we have cooked to make potato salad. Course, it wouldn’t be a real meal without some collard greens. We can make you up some of Grandma’s mac-and-cheese and a few other specialty sides. We do it just the way she taught us. Course, we cannot share the recipe, but we can sure make you some, bring it on over and serve it up. Once you’ve had a taste, there are simply no other options. We are the only folks in the whole area who do barbeque with hard wood. That flavor cannot be reproduced. It has to be done right. 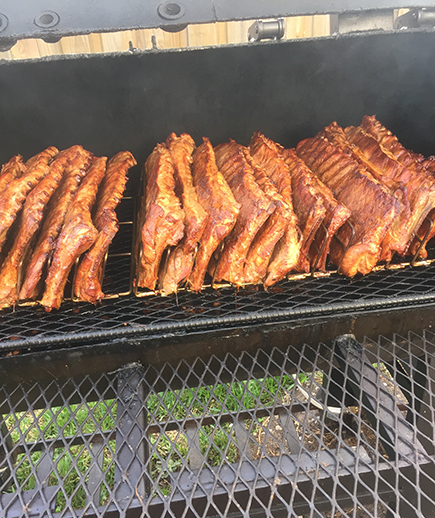 We take the time to smoke the meat. Afraid we might just be a little “too southern” to cater your event? Not so! We love what we do. We share our great food and enthusiasm just the way you like it served. We clean up real nice and we are happy to professionally cater the event with the style and the tone that you are looking for.